Sword Art Online’s video game adaptations should be applauded for bringing a storied concept from the source material to life. That concept is of course the titular world of Sword Art Online, a fictional virtual reality-based multiplayer game (or, to use the inelegant acronym, a VRMMORPG). Whereas developers of similar anime games are content rounding up characters and thrusting them into whatever mould seems adequate (fighting games being a frequent target), the Bandai Namco-published titles have always strived for authenticity and embody what the popular anime and light novels are all about. Put simply, the video games are a natural extension of the IP. Related reading: This series has come a long way from its barely translated original. Matt's review of that one. 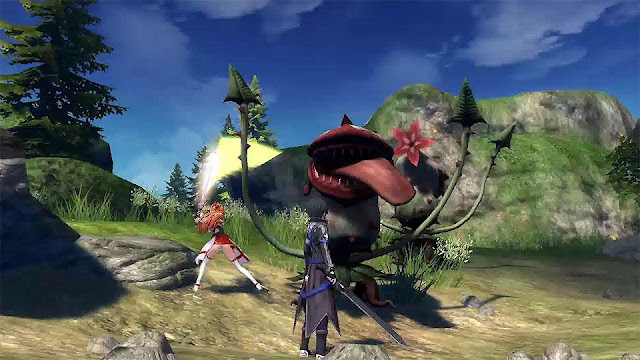 Sword Art Online: Hollow Realization features the latest interpretation of the game’s land of Aincrad, this time rechristened Ainground. Despite reusing assets from past titles, the innumerable tweaks and overhauls should certainly beguile existing fans of the franchise. If you’ve never played one of the prequels, though, let’s make this perfectly clear from the outset: these games are single player MMOs. That’s not to say they don’t boast an overall gameplay structure identical to 95 per cent of the free-to-play titles you’ll find on a PC, though; the grinding, quests, mobs, inventory management, and just about every mechanic is executed as you’d expect here. You’d be forgiven for believing it was full-fledged MMO at a glance due to the actions of AI-controlled NPCs that work hard to replicate the visual style of having hundreds of real people wandering around the world. The defining attribute of the Sword Art games thus far, though, has been this absence of human socialisation. Despite boasting environments and actions identical to MMOs, the shift in atmosphere is tangible. It lacks the incessant chat spam, the pestering guilds, and the flurry of trade requests. Instead, there’s a serious sense of camaraderie in this pleasantly upside-down world where the “players” are largely benevolent; the games feel like the manifestation of what actual MMOs could be in an ideal world where cynicism is tucked away. The player’s custom avatar can form parties of four where each member plays the archetypal roles (healer, tank, etc.) at the player’s behest or act of their own accord. Should your virtual party members happen to bark orders at you during battle, it’s more of a love tap with noble intentions than an incensed buddy about to snap his keyboard clean in half. Because Hollow Fragment is based on an anime where the characters exist outside of the virtual world they temporarily inhabit, there’s a concerted effort to acknowledge that. This is done through the use of scripted scenes that play out like your average visual novel or JRPG, which gently expound on who these people are outside of the video game they’re playing. They also further establish Sword Art Online as a single player experience using more traditional character building and dialogue than contemporary MMOs. Having said that, this dialogue tends to be fanservice-centric. For anyone who isn’t acquainted with these folks, and even those who are, the charming and humorous banter amongst friends will be the focal point here. This is because Hollow Realization doesn’t try to be much more than an entertaining romp with the odd injection of mystery and drama. There's something resembling a story here, yes, but the game is driven forward by the hacking and slashing, side quests, and item collecting over all else. The lack of a strong narrative is a missed opportunity considering that the dual world setting theoretically enables storytelling opportunities otherwise unfeasible. For instance, the original story arc of Sword Art Online dealt with humans becoming trapped in a video game for years. This automatically introduced tension, an end-goal, and consequences to the journey of the characters. 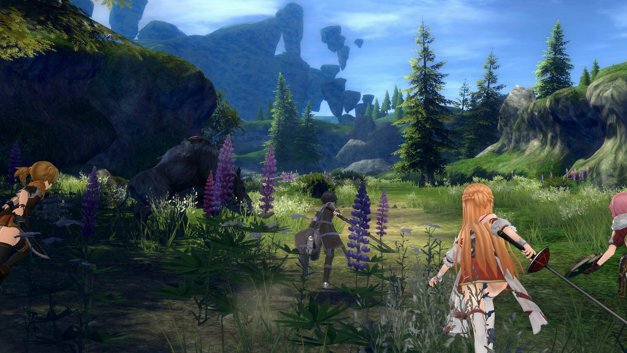 In Hollow Realization, the protagonists are back in the once-deadly world of SAO (one that nearly cost them their lives and put them in the hospital for years) because…it’s fun, basically, and might not get them killed this time. Main character Kirito is defensible in that he wants to become a game designer so he’s going to have to deal with the shenanigans of killer VR software someday, but the other characters have questionable motivations for jumping into any game called “Sword Art Online”. That old plot structure obviously doesn’t need revisiting and the writers need to get the characters playing VR games for the series to progress, but later arcs of the series such as Gun Gale Online revealed alternative methods for generating long-term intrigue. On the other hand, I would argue the immediate stories within Sword Art Online's universe (be that the light novels, games, or anime) have never been the meat and potatoes compared to the aesthetics and the characters themselves. If they were intended to be, it's impressive the series achieved such great heights. That's not a potshot at the creator so much as recognition that many storylines seemingly go untapped by design. The writers do, however, manage to tell more sophisticated tales using the backgrounds, interactions, and emotional depth of the cast. In particular, female characters such as Sinon, Leafa, Asuna, and Zekken have acquired strong fandoms not simply due to their functional positions in the story as Kirito's posse or their attractive designs (okay, who am I kidding, the latter helps a ton). 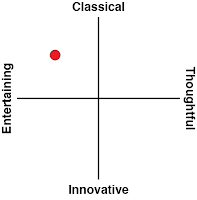 They're gradually fleshed out to be engaging and relatable on simultaneously emotional and intellectual levels. To use an example, the cutesy Sinon is actually the avatar of a troubled young woman experiencing post-traumatic stress disorder. Her inner turmoil and desire for escapism during the Gun Gale Online arc is the foundation of the story in which she makes her debut. Audiences then perceive Sinon’s every action through a sympathetic lens and watching her develop is arguably more poignant than all the Gun Gale story’s twists and turns. 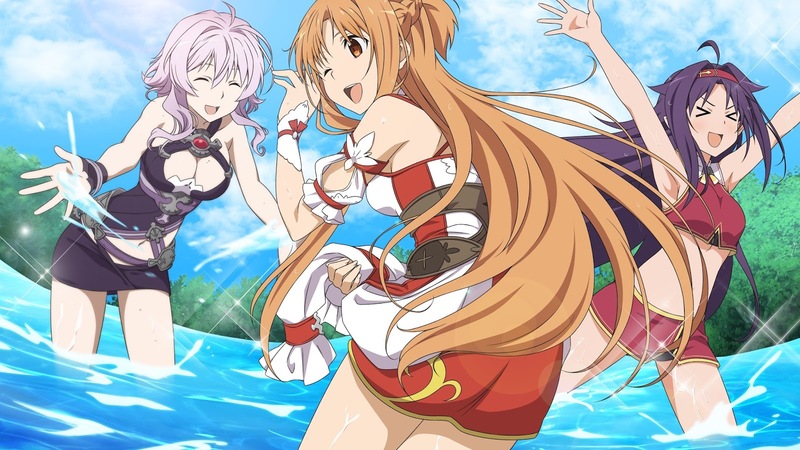 But because Hollow Realization is just another game of its format and wants the player to have a jolly time with the pseudo-MMO gameplay above all else, it does little to rock the boat by leveraging these characters’ pasts and distinct personalities. Exploring these relationships or expanding on them further in the context of a video game might rock the boat, so none of the existing entities are in rare form here. Instead, a brand new character built specifically for this title, Premiere, gets her time to shine. Being an artificial intelligence (AI) whose personalities was apparently based off tweets, she’s automatically the most fascinating piece of the plot’s puzzle. The last several paragraphs are my gratuitous way of saying the following: Hollow Realization is aimed squarely at existing fans. The game does a shoddy job of explaining the series’ history outside of a few key events, so one of the franchise’s focal points is neutered unless you already know what you’re getting into. So while the latest SAO title is profoundly successful in bringing the world of Aincrad/Ainground to life once again, it doesn't do much outside of that. Thankfully, the gameplay here has been fine-tuned to better satisfy fans of the previous outings. Because the world is no longer subdivided into many separate floors, Ainground has a certain organic quality that strikes a nice balance between the vertical environments of Lost Song and something more traditional. The menus are cleaner, faster, and less cluttered…once you figure out how to use them, naturally, since there’s only so much you can compress and streamline several dozen options. The game doesn’t do a great job of juggling tutorials in the early going and item descriptions can be vague at best, but this is an exceedingly dense experience so you’ll have time to find your bearings. In a perversely nostalgic way, I’m actually glad this Vita version features some occasional lag as that sums up my MMO experience during the mid-2000s. One of my favourite features is the character creator, which is better than ever. It kicks off the game on a positive note, not drowning you in excessive options. The choices for all the key traits like hair, weaponry, and skin colours are wonderfully vibrant compared to most anime games of lesser and greater budgets. Realistically, nearly everyone is going to be able to put together a virtual avatar they can get behind. That's important because piloting a likable character model and slowly enhancing it is crucial to an MMO you can pour over a hundred hours into. The ability to recruit a whopping 300 NPCs ranging from iconic side-characters like Klein to game-exclusive ones also warrants mentioning. 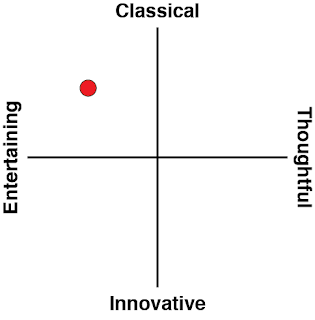 This means you’ll never be at a loss for varied tactics and every area presents an opportunity to meet new pals. Some of the new characters boast an amusingly genuine range of responses, such as woodenness in response to the greeting from a random person with nothing to say. You can even elect to romance the many gals and guys of the SAO universe, which should be right up everyone’s alley. As mentioned previously, these partners also chat it up in the midst of battle, which brightens the mood in addition to allowing greater functionality. As for the combat itself, the designers have outdone themselves. Some will inevitably file it under “button-masher” due to the streamlined number of buttons used for attacks, but there’s no denying that skirmishes are vastly improved here. Tapping away is certainly possible, but it’s never the ideal approach when game actively rewards well-timed swings with gratuitous damage output. I would go as far as to call a few mechanics downright brilliant in concept, such as the idea of rewarding the AI-controlled allies with compliments to promote desired behaviours in combat. It's not just clever game design; it meshes with the world of SAO and feels pure in how it plays out to that point that it doesn't feel forced. The systems in place here are certainly expansive and function as they should. At absolute worst, it's more functional and engaging than several free-to-play MMOs the game riffs on, which gives SAO an edge right there. For better or worse, virtually all of Hollow Realization’s quests still fall under the expected categories. You’re fetching items, raiding boss monsters, or clearing X amount of fantasy beasts from an area. This has a side-effect in revealing the shortcomings of a single player MMO. Video games all repetitive in a particular sense, but well-designed ones are able to disguise that or draw you in through ingenunity. For instance, a true multiplayer MMO has the power of real-world interactivity working for it. You can meet new people, maintain friendships through rivalries and shared discoveries, or compete against minds (potentially) more intelligent than mere AI. A single player MMO fights an uphill battle trying to maintain that intrigue indefinitely. 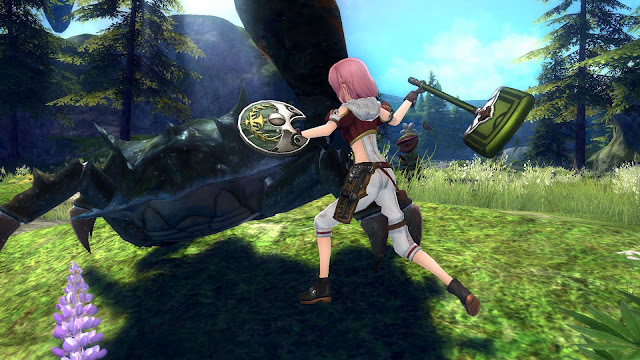 The good news is that Hollow Realization allows for online quests this time around, but the number of player-controlled characters is too infinitesimal to be considered “massively multiplayer” and the activities are restricted. It’s readily apparent this was designed as a single player experience. 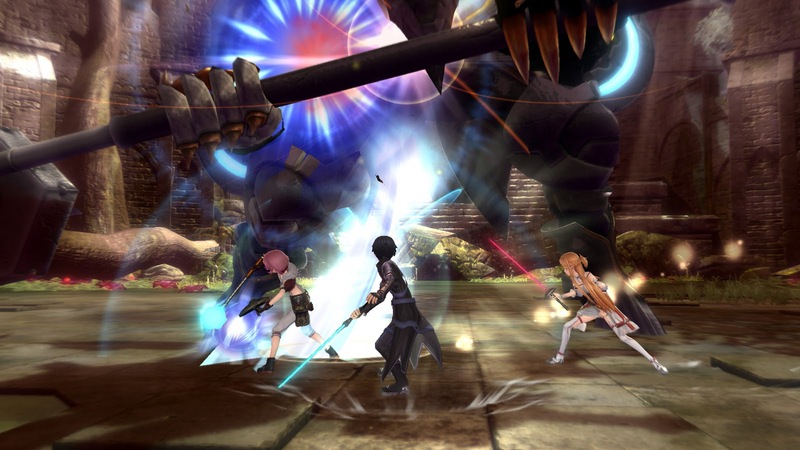 Related reading: Sword Art is also on PlayStation 4. Read Nick's review of Lost Song here. Sword Art Online: Hollow Realization augments the formula of past entries and largely succeeds by doing so. Flaunting striking landscapes that feel plucked from the anime but retooled for newfound novelty, series aficionados will find plenty to love. It’s just hard to shake the feeling that, if injected with a stronger narrative and creative risks that better played to the IP’s core themes, it could have been elevated from pleasant fanservice to an essential outing. Experience the game with the mindset of wanting to get lost in a virtual world, though, and you’ll be pleasantly surprised by Hollow Realization’s hidden charms.